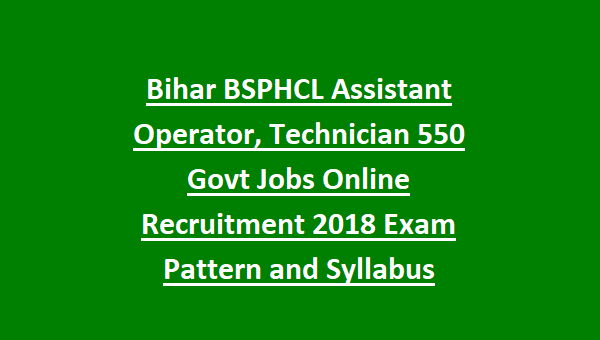 There are total 550 posts in this Bihar BSPHCL recruitment 2018. As on 01-01-2018 candidates age limits are 18-37 years and for BC/EBC candidates age limits are 18-40 years and for SC/ST candidates age limits are 18-42 years. Candidates must have qualified Degree for applying this Assistant jobs. Selected candidates will receive Pay Band - Rs. 15,500-29,300 which is level 7. Selected candidates have to work 2 years under probationary. Candidates selection will be based on written exam only for this Assistant jobs. 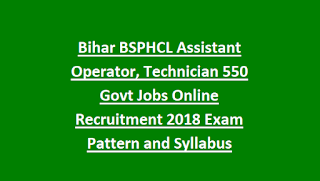 Online applications only accepted for this BSPHCL recruitment of Assistant posts. Last date to apply online for this Assistant Operator, Technician Grade IV jobs is 08-09-2018.